GSHPs provide space heating and cooling by transferring energy between the ground or body of water and a building. They are very different from combustion appliances, such as furnaces, stoves, and boilers, which create heat by burning natural gas, propane, fuel oil, or wood. In heating mode, the heat pump removes heat from the ground or body of water through a circulating fluid and then transferring heat to a building. In cooling mode, GSHPs “dump” heat from the building’s interior into the ground, much like a refrigerator transferring heat from the inside the icebox to the outside through fluids and coils. In both cases, GSHPs use electricity to operate a compressor and pump to facilitate this heat transfer. In short, GSHPs rely on both electricity and “free” energy of the earth. Heat pumps are considered a partially renewable energy technology. The energy available to GSHPS is a combination of heat from the sun and earth (geothermal. The energy harvested from the ground in the winter is replaced by the sun in the summer, thus the resource is renewable. Using the system for cooling also transfers heat back to the ground in the summer. The electricity used to operate the compressor and pump may not be from renewable sources unless renewable energy is purchased from a utility (i.e., renewable energy credits) or produced on-site from small wind or solar. Like other electric heating systems, an existing GSHP may become “more renewable” as utilities integrate more renewable energy into their fuel mixes. Distribution system that moves heat throughout a building. The ground loop component is comprised of tubing that passes through the heat source/sink. (If used for heating, then the heat source is the ground; if used for cooling, the heat source is the building and the ground is a heat sink). The loops can be buried in the ground vertically or horizontally in various configurations. Loops can also be placed in a water body. Heat is transferred to or from the ground/water to a fluid. Both closed loop and open loop designs can be used. The design of a loop field is fully explained in Step 3.
system moves heat into or out of a building. GSHPs are compatible with many standard distribution systems, including some hydronic (e.g., in-floor heating) and forced air systems. In heating-dominated climates, low-temperature distribution systems are preferred. 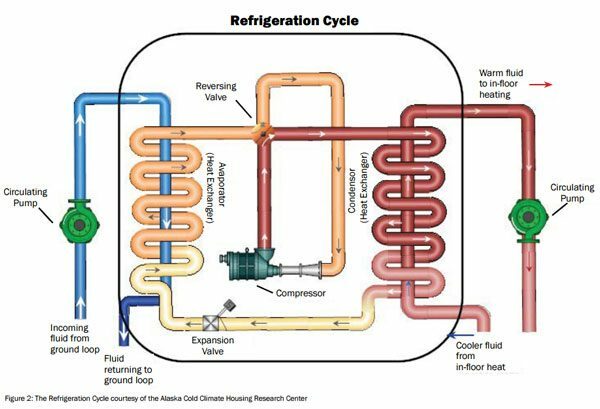 The refrigeration cycle used in a GSHP system in a heat pump is similar to a refrigerator. Figure 2 shows the operational flow of a heat pump system working in the heating mode. The ground loop fluid (in blue) passes heat to the refrigerant fluid (in tan) cycling within the heat pump, which then boils at low temperatures and turns into a gas. This vapor is compressed (in red), further raising the temperature. The heat is then passed to the building’s distribution system. The cycle is completed when the refrigerant is condensed. While a GSHP system requires electricity to run the pumps/compressor, the primary source of heat is the energy gathered from the ground. In cooling mode, this cycle operates in reverse, collecting heat from the interior of the building and sending it to the ground loop for dispersal. in the cooling mode, the performance is measured by the Energy Efficiency Ratio (EER). The EER is the ratio of the amount of cooling provided compared with the electricity required to operate the entire system. As with the COP, a higher EER value indicates greater efficiency. Efficiencies measures are also reported by seasonal values – Seasonal COP (SCOP) and seasonal EER (SEER). The seasonal measures consider efficiency impacts due to ground temperature changes, as well as efficiency losses due to the pump and compressors cycling. Seasonal measures assume there is no exposure of pipes to the outside weather, but rather a direct connection from underground to the building. Overall, seasonal values are a more accurate representation of the efficiency of the heat pump operating throughout the year in a building or home. Visit the Department of Energy’s Energy Saver website, www.energy.gov/energysaver/articles/geothermal-heat-pumps for videos on how GSHPs provide space conditioning.